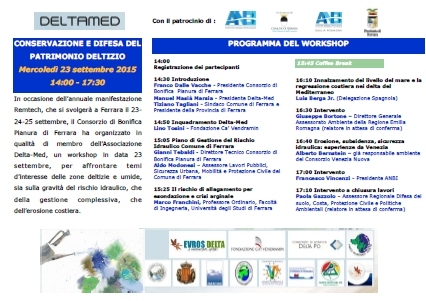 On September 23rd, 2015 on the occasion of the annual exhibition Remtech, the Consorzio di Bonifica Pianura di Ferrara, as a member of Deltamed Association, organized a workshop to discuss issues of interest in the delta areas of the Mediterranean. 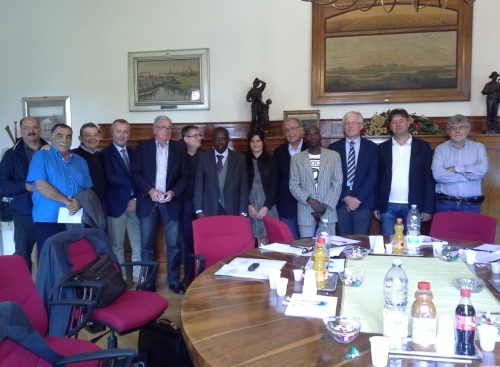 Technical committee on September 24th, 2015. 1. Conclusion of Deltamed’s Workshop Conservazione e difesa del patrimonio deltizio held on the 23rd, by the President of Consorzio di Bonifica Pianura di Ferrara, Dott. Franco Dalle Vacche. 2. Analysis of the application for membership in the Deltamed Association of the estuary of river Casamance (Senegal). 3. Report of the findings and proposals to the EU on the apple snail pest, a document by pest specialist Dr. Ravindra. 4. Proposal for renewal of office, as Deltamed’s Advisor, of pest researcher and consultant Dr. Ravindra.